Hello guys ! So everyone were asking things to do in Bangkok and here we are ! I’m not an expert of Bangkok but I can tell things that I did when I was in Bangkok. 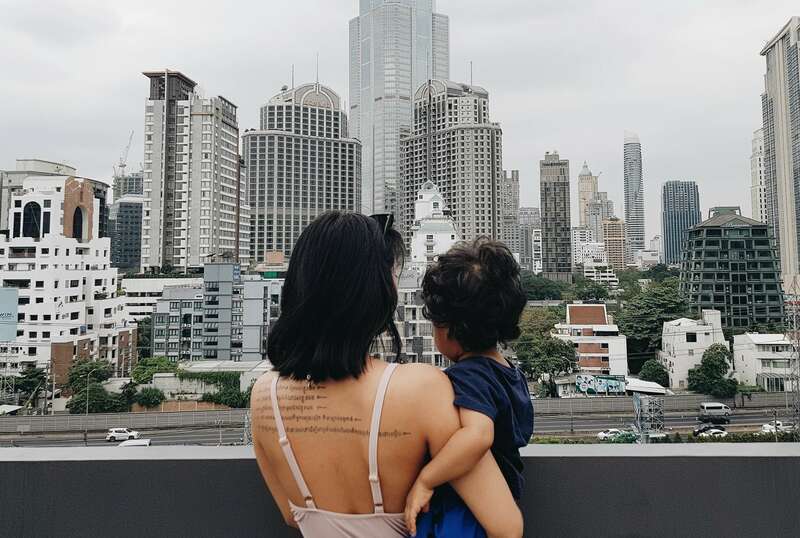 I’ve been lost for 2 days with my son Julian and now, I think that I can run into that city like a boss 🙂 Well almost… Because as you might know, Bangkok is like a really big city but also a maze combine with dirty streets and a pic of pollution. They are also a lot of traffic and the city never sleeps. You just don’t want to spend time outside of the city but only inside of the buildings. So today, I will make sure to share you good things to do in Bangkok through my eyes. First of all, you can visit the temples that Bangkok offer near to the Chao Phraya river. You can reach the temple by taking the BTS until Saphan Taksin to take the orange bus boat which cost only 15 bath. It will bring to the main temple like de Wat Arun, The Royal Palace, Wat Pho and more… The great things by taking the boat is that you will forget the traffic of Bangkok and make you enjoy being in the city. If you like to shop to buy some presents before you leave but you are running out of time and you still want to enjoy Bangkok. The best deal is to enjoy the night market and strolling around the night market to find some junkies stuff and clothes. Plus, you can enjoy street food for less. Also, If you like to shop to buy some presents before you leave but you are running out of time and you still want to enjoy Bangkok. The best deal is to enjoy the night market and strolling around the night market to find some junkies stuff and clothes. Plus, you can enjoy street food for less before to head the bed. I went to one of the famous night market Ratchada Rot Fai Night Market. My friend Dalia brought me to a nice place named « The River Shack » to eat front of the Chao Phraya River. You can reach that restaurant from the Saphan Taksin BTS station. Of course eating food is a thing to do 🙂 As you may know, I love food and I won’t talk about padthai but I definitely encourage you to taste the sweet mango sticky rice. If you like sweet mango maybe you will enjoy the sticky rice with a lack of milk coconut. It’s just must to try. Also, I love the coconut ice cream there and they put some peanuts and also with mango which is dammnn so good. I miss it already. Please take some if you get there ahah. Unfortunately, I didn’t have the chance to go there because I think I was lazy to be in crowed area with the pollution. So maybe next time. I didn’t party there but everyone heard that this is the the place to be for nightlife party. I couldn’t make it to that tour because of like of time. I went out too late but my friend Dalia did go there. She was happy to enjoy the view from the King Power Tour and the price is around 20 euros. Ok, next time I need to visit that ancient city Mueang Boran ! I just discovered that place on Instagram just before I left Bangkok but I will come to Bangkok and I will definitely visit Mueang Boran. An another thing that I had to do but was a bit lazy. So It’s on bucket list the next time I head to Bangkok. People keep saying that it’s super nice to explore. Most of the time, the floating market are open only the early morning and during the weekend from friday to sunday. Well there are so much to do but you might not like to stay to much time because of pollution. But I took my time to discover Bangkok and I enjoyed it a lot because I know where I like to go and to do there.